After the wing plane revolution on racing cars that began in 1966 (1968 in Formula 1) and the appearance of ground effect in 1977, aerodynamics took on a front line role on the track with winged cars, switching from traditional studies of resistance to advancement to the exploitation of negative lift in order to increase speed through the corners. 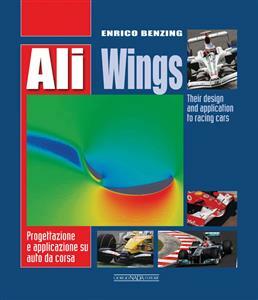 In this new edition of the first book to appear on the subject in 1991 by Enrico Benzing, one of the best known engineers in the world of Formula 1, this complex subject is explained with completeness and simplicity of expression, so that it can be read and understood by everyone. The motor racing wing is at the centre of the story, while the picture is completed by the entire aerodynamic behaviour of the racing car, especially the single seater, touching on particular aspects such as the Magnus effect, ground effect, calculation of power resistance and matters related to the wind tunnel. The volume also includes a specific chapter on CFD (fluid dynamics computation). Hundreds of illustrations enhance this work, which is an indispensable starting point for people who want to know all about this complex but fascinating subject.